Posted on Aug 18th 2013 by City Staff. Download the registration form for the 2013 Wellsville Founders’ Day Fun Run. Then either bring to the City Offices at 75 East Main Street, or mail the registration to Juanita Malm, PO Box 210, Wellsville Ut 84339. The last day for IN-PERSON PRE-REGISTRATION (AND TO RECEIVE THE PRE-REGISTRATION DISCOUNT) IS August 29 at 4:00 p.m. If mailed THE REGISTRATION MUST BE RECEIVED BY August 28TH FOR PRE-REGISTRATION DISCOUNTED PRICE!! Posted on Aug 12th 2013 by City Staff. End of Summer Bash! A carnival will be held Friday August 16 at the Wellsville Square from 6:00-9:00 p.m. (all proceeds will go to the Wellsville Tabernacle renovation). Food, games, prizes, and a free movie will follow at 9:00 p.m. Don’t miss out on the fun! 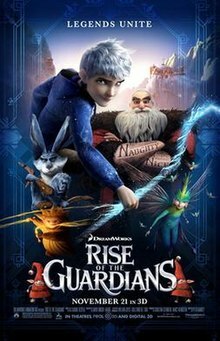 The movie is Rise of the Guardians – should be fun for the entire family! Thanks to Sam Winward and the other members of the Parks & Recreation committee for putting this activity together. Free Firewood – Now that 400 South from Center to 100 East is being opened up for the new trail we have a very large amount of “you cut” firewood available. The firewood can be accessed from the gate on Center Street or from the northeast end of the hay field west of the Baseball field. Basically, any trees that have fallen down or are still standing but are dead, or obviously dying, in the 400 South right of way can be removed. Please recognize others may be cutting so do not take anything that is already started. Call Gary at 245-4795 if you have any questions. Thanks and be careful. Posted on Aug 7th 2013 by City Staff. Mayor Tom Bailey is warning Wellsville citizens to be alert for a mountain lion that has been spotted in the south end of Wellsville (near the Wellsville Dam and in other areas). Mountain lions can roam over a large area so all citizens of Wellsville should be on the alert. Please take extra precautions with your children and small pets. The Utah DWR has been contacted and Mayor Bailey will be following up with them. Please warn your neighbors to be on alert as well. Mountain Lion Update – The Utah DWR has been out and looked around for signs of the mountain lion recently spotted at the Wellsville Reservoir. The DWR officer did not find anything so they are hopeful we no longer have a problem. If anyone spots the mountain lion again please call the Cache County Sheriff at 753-7555 (or 911 if you feel threatened) and request they contact the on-call DWR officer immediately. Posted on Aug 4th 2013 by City Staff. AUGUST 5TH– Family Bike Night (for all levels) meet at the Wellsville Square Bowery at 6:30 p.m.
AUGUST 16TH– End of Summer Bash! A carnival will be held at the Wellsville Square from 6:00-9:00 p.m. (all proceeds will go to the Wellsville Tabernacle renovation). Food, games, prizes, and a free movie will follow at9:00 p.m. Don’t miss out on the fun! Click here to download a PDF copy of the Founders’ Day Schedule of Events for 2013. Registrations for the Annual Wellsville Founders’ Day 5K, 10K, and Kids K (1 mile) races are now being accepted! The races will begin on Labor Day Monday, September 2, 2013 starting on the east side of the Historic Wellsville Tabernacle. All races start at 7:00 a.m. sharp! Race day registration begins at 6:00 a.m.
Pre-register at the Wellsville City Office (Monday – Thursday 9:00 – 4:30) by August 29th for only $10. Race day registration is $20. Kids K registration is a flat fee of $3 (no tee shirt). Come enjoy a beautiful place to run! Great prizes will be given! For more information contact Juanita at 435-245-7831. As storm water flows over driveways, lawns, and sidewalks, it picks up debris, chemicals, dirt and other pollutants. Storm water can flow into a storm sewer system or directly into a lake, stream, river, or wetland. Anything that enters a storm water system is discharged untreated into the water bodies we use for swimming, fishing and providing drinking water. Polluted runoff is the nation’s greatest threat to clean water. By practicing healthy household habits, homeowners, can keep common pollutants like pesticides, pet waste, grass clippings, and automotive fluids off the ground and out of storm water. Adopt these healthy household habits and help protect lakes, streams, rivers, wetlands, and coastal water. Remember to share the habits with your neighbors! Storm water drains connect to water bodies! Remember don’t put anything in the storm water drain that you wouldn’t want in your drinking water! The utility account must be in the name of the military member or the spouse of the member. A copy of the deployment orders must be presented at the City Office. A “Military Utility Fee Waiver” application must be completed and presented to the City Office. The waiver will be issued for a 6-month period of time, unless deactivation occurs sooner. It is the customer’s responsibility to renew the waiver every six months to extend the benefit. The fee waiver includes only the base rate of water and sewer. Water overage, garbage collection, storm water fee, communication center (E-911) fee, fire capital fee, interest and other fees still apply. Utility Fee Waiver will be effective as of June 1, 2013. Customer agrees to notify the City immediately upon return home and deactivation of deployment. Please feel free to contact the city office if you have questions concerning this.